Our world is busy, crazy, non-stop. We always have something – or two things- going on. Then we find the ahh… that peacefulness that comes when we are still, especially when we are still in creation. God designed things to work and then to rest. It is during rest that our bodies heal and our stress decreases. It is as if we are re-created. Get it, recreate as in recreation? 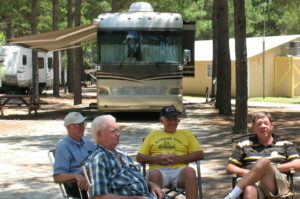 So what does recreation look like at Beaver Run RV Park? For some it is sitting under an awning, for some it is swimming or floating on the lake, for others it is playing yard games with their family and friends. Ahh, green grass, trees, water. When was the last time you enjoyed the ahh moment?